Prior to the referendum Peter Wilby, writing in The New Statesman, said that a happy outcome of the referendum campaign was the humiliation of David Cameron. True, it did look at one point that the leader of the Conservative and Unionist Party would preside over the break up of the union but when it comes to humiliation you need look no further than than Ed Milliband. He and the shadow cabinet were invisible throughout the campaign in what is, if a head count of Labour MP’s is anything to go by, a Labour stronghold. Only at the very last minute did the labour front bench arrive in Glasgow, where they were met by a man on a rickshsaw playing Darth Vadar’s theme from Star Wars and chanting “here are your masters.” This foray north also saw Ed Milliband walking away from a woman who was asking why Labour support payments for the retention of the trident nuclear missile system when people like her were struggling to find a decent home. Gordon Brown, largely on his initiative it would seem, took the Better Together campaign into his own hands and forced the leaders of the 3 main Westminster parties to sign a vow to transfer further powers to Holyrood in event of a no vote. Not travelling together or appearing on the same platform when in Scotland does not excuse Ed Milliband from standing alongside the tories. Scottish Labour was even more abject in it’s failure to respond effectively to the yes campaign. They have underestimated the Scottish people before, believing that the voting system for the Holyrood parliament would ensure that a mandate for a referendum would never be secured. In 2011, despite the voting system which was supposed to prevent it, the SNP gained a landslide victory which made the referendum inevitable. Scottish Labour has treated the SNP government, in majority control since 2007, as a blip. It has failed to respond as effectively as the SNP, and more recently the alliance of organisations that make up the yes movement, have stolen the ground on issues of equality, fairness and social justice. This movement , which has prompted a huge increase in membership of the political parties which urged a yes vote, is now the natural home of those seeking an alternative to the austerity agenda imposed by the ConDems and parroted by Ed Balls (and Ed Milliband if he’d remembered that part of his speech) at the Labour Party Conference. While the welfare state has been rolled back in England and will stay rolled back even if Ed Milliband gets into power in 2015 Alex Salmond and the SNP have moved forward on issues such as free prescriptions, social care for the elderly and scrapping tuition fees. The Labour Party has become so complacent, so sure that it could rely on habitual labour voters to turn out and vote along party lines, that it had few records of who those voters were, where they lived and whether they would vote no as instructed by the party. Large numbers of grassroots activists, alarmed that the party would stand shoulder to shoulder with the tories and liberals, refused to canvas for no. As a member of the co-operative party, I received a letter “urging Scottish Co-operative Party members to support our sister party, the Scottish Labour Party’s United with Labour campaign”, and I duly resigned from said party. Getting the labour no vote out depended in large part on activists from Wales and the north of England who, as well as being unfamiliar with the territory, were themselves often less than 100% committed to the better together cause. There are some labour supporters who do, without question, back the union. Until 1965 there was a Unionist Party in Scotland and it was, at that time, the party of the protestant working class. We saw them out in support of the Orange Lodge and at the centre of violent protest in George Square immediately after the referendum result was known. I can understand why the Labour Party would want to preserve the union as Scotland regularly returns a large number of Labour MPs to Westminster. But why would Scotland support Labour? Why should voters in Scotland continue to support a party whose policies include maintaining Trident, allowed privatisation of the NHS, support the ConLib austerity measures and recommend cuts to public spending and and a party whose MPs vote to wage wars overseas. There is a mood in Scotland, started in government by the SNP and energised by the alliance of groups who united around the yes campaign, for a fairer, more just society. Elections in 2016 might see parties who support this agenda flourish. In the meantime there is the 2015 UK general election. If Peter Wilby thinks David Cameron has been humiliated – Peter, you aint seen nothing yet. Well not quite, but not enough of Scotland’s 5.5 million people were like like us. So what, if anything, happens next? Social media has been filled with new groups rallying the 45, that is the 45% of people whose argument failed to win the day. The appeal to the 45 reveals a lot about what went wrong with the campaign. We were talking to ourselves. We have to look at the reasons people voted yes, and no, before deciding where to go next or we will spend the next however many months and years just talking amongst ourselves. The nature of the question on the ballot form, a simple yes or no, made it easy to rally behind one side or the other but the reasons people voted yes, and indeed no, are complex. For me the question was one of governance; decisions should be made by the people who those decisions effect or as close as possible to those people. Independence could deliver just that and only that; an independent government. The nature of that government, left, right or centre would be determined in the Scottish elections of 2016. However the yes campaign led on creating a better society. Now, I happen to agree with a lot of the social justice arguments of the yes campaign. After all who wouldn’t want a fairer society? It’s a mums and apple pie thing surely? But that was not the question being asked and anyway, do people put the interests of society ahead of their own interests? I think not. The UK has a right wing government promoting divisive austerity measures not because the ConDems fell from the sky and took control, but because 60% of the people in the UK voted for them. Way back in June, only 3 months and yet a lifetime away, I argued that relying on the feeling that people in Scotland are somehow so very different to the rUK might be misplaced. The no campaign were very successful in persuading some people that their immediate interests; their money, their jobs, their personal safety, would be best protected by voting no. Call it a campaign of fear if you like but it successfully appealed to self-interest. Take the case of one young woman who intended voting yes and then had a very last minute change of mind for fear of having to carry two sets of currency and, since she lived in the borders, didn’t want to risk the hassle. Alex Salmond repeated ad nauseum that Scotland would keep the pound. Of course it would have, the economic argument is overwhelming, but the case wasn’t made in a way that convinced the fearful. And I’ve already heard apologies from women whose hearts were for yes but voted no as they were unsettled enough by the fears raised by no campaigners. Gordon Brown wading in at the last moment probably persuaded some that the UK government would pay more attention to the needs and desires of the Scottish people, but quite how the backbench MP for Kirkcaldy & Fife is going to compel the UK govt to do anything is another matter. What is the correct response to those women. Hell mend you? I think not. I am on the steering group of an organisation working for increased diversity in Scottish and rUK boardrooms; particularly but not exclusively getting more women on boards. A fantastic peer-to-peer support network with women, and men, working to change the make-up of public and private sector boards in order to change the way organisations work. Equality legislation is currently not a fully devolved matter. The Scottish Committee of the Equality and Human Rights Commission reports in to the UK government equalities office. For example, should the Scottish government wish to introduce quotas to speed up the introduction of more women on boards it could not. An equality issue if ever there was one so surely most of the women involved in this network would vote yes. For most the answer was no. To many of the women involved in the group equality is important but not overridingly so. Many work for legal and financial companies who threatened to move HQ’s from Scotland should the vote have been yes. The women were not scared of this prospect and frightened into voting no. These women agreed with, and fully supported, that position. An appeal to social justice was never going to win those voters over. Finding ways to include people to the right of the debate is going to be a challenge but there is some common ground and we have to find ways of changing the minds of these women and men if we are going to build a better society. I know many people who intended voting yes who have their children educated at private schools. That does not fit in with my view of equality and social justice so their reasons for voting yes were likely to be very different to those to the left of the campaign for yes. In knocking on doors to get the vote out on Thursday I spoke to very elderly women who were almost in tears at the prospect that, after 50+ years campaigning for the SNP, Scotland might actually become an independent nation state. I feel that I have let them down at a personal level, that I couldn’t deliver their dream. But it wasn’t my dream. I’m English, after all. I’m not a nationalist, but many are and that was their reason for voting yes. Whatever might have happened to the country after that was of lesser importance than the fact of independence. I was advised by local SNP activists that they used to be dubbed the tartan tories. I’m not a political historian but suspect that the nature of the party has changed beneath the feet of these long-time supporters but the notion of independence has held them in one camp. What now for the SNP? Just yesterday I showed a woman around my flat, which is for sale right now. She mentioned that the local church seemed to be having a service of reconciliation; as she put it, “something to help those upset by the result”, adding with a sneer, “not that there are many of them.” She was probably correct in that not many people in my bit of Crieff voted yes but it was the way she said “them”. I was sorry that the yes poster had already been removed from the window but suggested that there were more of “them” than she might imagine. She saw me as one of “us” not “them” as I live in a very nice, well appointed apartment in a very beautiful part of Crieff. It would be wrong to speculate on her reasons for voting no but I suspect class has something to do with it. To paraphrase Tommy Sheridan, look at the people who are voting no and ask yourself why. We didn’t do enough of that before the vote. Neither did we look at the diverse reasons for people voting yes. There were some fantastic groups that rallied the people of Scotland for yes. Many are now looking to find a place for themselves going forward. The first thing to do is to acknowledge that we lost. Those groups and that message was not effective or, in fairness, not effective enough. The yes campaign also raised the profile of many individuals, some of whom are also active in trying organise groups to head up the next steps Doing the same thing and with the same people will not deliver social change. I have huge respect for what Lesley Riddoch, for example, has to say but was swayed far more my the arguments made by individuals who I’d never heard from before. Lots and lots of voices all talking for ourselves being supported in having our voice heard rather than being filtered through groups or personalities. There is a real danger that the energy released by the debate, energy which encouraged thousands of people who had never before engaged with the political process to go and vote, will be lost in the feeling that it made no difference. We have to find out all of the reasons that the 45 voted yes and find ways of bringing in the many people who now regret having voted no. We cannot just keep talking amongst ourselves and assuming that we all had the same reason or voting yes. In particular we must deliver for the thousands of young people who we let down. My own son was interviewed on Radio 4 as the results came in, just after the Dundee declaration. He spoke eloquently and clearly about his own reasons for yes and I’m incredibly proud of him. My life has been enhanced beyond measure in the last months by being able to talk to him about the issues that matter to us all. My suggestion is that all of us that already have a profile should stand aside and let the next generation through. Let them talk about the next steps and how they would like to see Scotland develop. And if we need a spokesperson I know just the man! In the late 80’s I went for a job as a sales rep and was horrified that the selection process required me to complete a full day of profiling at some swanky management consultants in Amersham. The tests suggested that I was a risk taker. I am not. In making any decision I analyse all of the available information carefully and dispassionately and then make my choice. Having made a decision I then act upon it. I think that it is this willingness to act promptly and without further hesitation that came through and allowed the assessment that I am a risk taker. However, acting decisively and taking risks are two completely different things. This methodology doesn’t guarantee that I will make what others might feel to be the right decision but what it does ensure is that I always make the best decision I can based on the information that is available to me at the time I’m required to make that decision. Of course as soon as the decision is made more information becomes available. The very act of making a decision changes the landscape. Time passes and more information emerges. A different option may emerge. This is the nature of decision making. At the start of the referendum debate I had an idea that, being an avid supporter of co-operative community development and local democracy, I ought to vote yes. Bringing decision-making as close as possible to those affected by those decisions and getting as many people as possible actively involved in the decision making process is a central tenet of co-operative development. As I listened and read, more information emerged and I became persuaded that, for reasons that I have detailed in other pieces throughout this process, a yes vote was the better option. What has surprised me is that choosing independence has been portrayed as being riskier than staying within the union. The no campaign has focussed on the risks associated with separation while the risks of staying have been overlooked or understated. Take this last minute offer of further powers being devolved to Holyrood. This ‘pledge’ has been made by three leaders who as individuals now seem to agree that Scotland should have some more power over it’s own decisions but who have very different ideas as to what those powers might be. Their parties have vastly differing views too. Even if the leaders had got together much earlier than just a week away from the vote there is no guarantee that they could have taken their parties with them. Leaving it until the last moment to come up with the offer to talk about more powers makes it impossible to be sure whether they are speaking for their parties and for Westminster or simply for themselves. UK government works by parliament not by presidential style diktat. Take David Cameron. He is already fighting to keep his party together in the face of challenges from Ukip, who may well have there first MP sitting at Westminster within the next few weeks. With a general election to fight in 2015 is he really going to persuade his back bench MPs, many of whom would like to see devolved powers decrease rather than increase, that they should support the transfer of more power to Holyrood? I’m sure that the leadrs will have to come up with something, if only to save face, but it will not be significant. If there was an appetite for further transfer of power it would have happened by now. One of the rules of leadership and decision-making – know where you are headed before you set out. A no vote will not retain the status quo, it will plunge the union into a prolonged period of confusion as leaders seek to deliver something to Scotland in the face of opposition from within their own parties at a time when those parties will be looking to fight a UK general election. And as the no campaign is fond of saying, the markets don’t like uncertainty. Far less risky then to vote yes. There will be lengthy negotiations as the details are discussed and the i’s dotted and t’s crossed but the destination is clear and known; full independence. Not everything, of course, is known. Not everything is yet knowable. But we will know where we’re head when we set out. I make decisions with my head but as we approach the 18th one feeling rumbles away in my gut. Imagine waking up on Friday morning to a no vote. We know what the rUK establishment had to say when Scotland decided against devolution in ’79 and it will be the same now. I have huge faith in the Scottish people to come together irrespective of the outcome to build a better Scotland. I have much less faith in the establishment and, in particular, the English press. I am not what my parents imagine to be the typical yes voter. That is to say I do not have a saltire painted on my face and I don’t wander round shouting freedom and I don’t hate the English (or Welsh or Northern Irish for that matter as, for those who haven’t noticed there are currently 4 nations in the UK). Until very recently, I might even have failed the Tebbitt test in not shouting for the Scottish football team when they played England. In the 80’s I didn’t even like Scotland and if my work took me to Glasgow or Edinburgh I’d do all I could to make sure that it could be completed in a day so that I could be up and down the M6 and safely tucked up in my Cheshire home by bedtime. Scotland was emotionally immature; content to live off scraps from the UK table. Devolution changed all that. Scotland as a nation existed before the Act of Union and had an established iconography of tartan, ships and shortbread. Devolution engendered a sense of self and possibility of what it might be to have full expression of a national identity. I’m not a natural SNP voter but YES is not a party – it is a movement to ensure that Scotland’s future will no longer be decided somewhere else. This is what allows me, being born and raised in England and having lived in Scotland for pretty much all my working life, to vote and campaign for a yes vote. A nation is not defined by ethnicity or geography. Being a nation is something that the people who live here all do together. The no campaign seeks to return Scotland to the pre-devolution mindset. To use a good Scottish phrase, “to put us back in our box”. We have seen this most clearly in the last week as the political establishment has scrabbled about recycling old statements from business leaders, rushing over the border for a day and offering bribes in the form of talks about the possibility of further powers moving to Holyrood. Rather than leaving the Scottish people to decide when there is a chance that we might vote “the wrong way” and choose independence, there is suddenly another offer on the table. Devo-max, if you will, as specifically refused by David Cameron when he insisted that the Scottish people should face a simple yes/no at the ballot box. If Scotland becomes independent, it will be despite the efforts of almost the entire UK establishment. Consider this weeks’ statements from RBS. Westminster, apparently, refuses to even consider sharing the pound, so to remain backed by the Bank of England, RBS would need to move registration to London. This is a purely technical, legal move, as the CEO confirmed there would be no operational change, but no campaigners were happy to make people fearful for their jobs and for the Scottish economy. The argument that Scotland can be economically independent was won long ago. David Cameron himself has said on many occasions that Scotland could be economically viable. Standard & Poor’s has said that wealth levels in an independent Scotland would be comparable with countries that enjoy a Triple-A credit rating – even without North Sea Oil revenue. Yet still the no campaign work to instill fear that we cannot manage without rUK support. Scotland pays 9.4% of UK tax income while having 8.4% of the population so we are not, contrary to Westminster, my mother, the no campaign and the Daily Mail, subsidised by rUK. Scotland’s share of defense spending is £3.5 billion, less than £2 million of which is spent in Scotland. An independent Scotland, therefore, would have an extra £1.5 billion per year if it kept defense spending at current levels – which personally I hope it wont. And do you know what? There is more to life than GDP. I would be prepared to pay a little more in taxes, a little more in the shops to ensure decent public services for the disadvantaged and vulnerable in our society. There is no doubt that public services are being dismantled in the rUK. Chief Medical Officer Harry Burns says that the UK faces increasing NHS privatisation and there is little Scotland can do about it if we remain in union. Independence won’t in and of itself guarantee services in Scotland. The elections in 2016 might, heaven forbid, return a Tory majority or the Labour government which presided over NHS privatisation. Independence is, however, the only way to guarantee that votes cast in Scotland will count. It is the only way we can influence the provision of public services. We decide the kind of country we want to be. Over the past 100 years votes cast in Scotland have influenced the outcome of UK general election only twice. With a yes vote Scotland will get the government – and the services – it voted for. There is a constant feed of fear and scaremongering coming from the no camp. 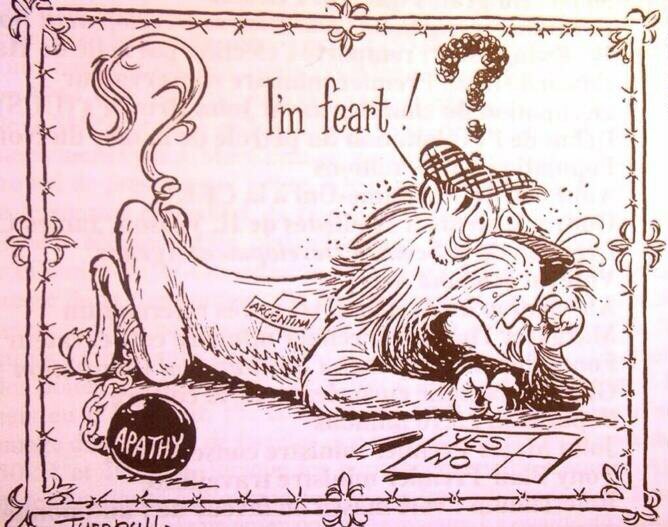 Fear is a liar and fear is the worst possible ground upon which to decide Scotland’s future. So are there any good reasons to vote no? As someone born in Liverpool and sharing it’s desire for a more equitable society, the only seductive argument is that Scotland should remain in the Union to save England from itself; that we shouldn’t abandon our fellow citizens to the Tories and their corporate pals. Well, the Union isn’t just England and Scotland. Scotland has a chance to become independent and the 5 million or so people north of the border should not be asked to forego this opportunity. There is no chance of political change within UK if Scotland votes no. There is a chance that, should we vote yes, Scotland can show what can be done and restore some hope to the embattled northern cities in particular. There is a massive amount of political apathy in rUK. The spirit of inclusion and engagement engendered in Scotland by the referendum debate has demonstrated that if there is something worth fighting for people can be tempted from their sofas. Those who have traditionally been bystanders have become organisers and politics has become inclusive and creative. Yes voters, those who want change in society have found a voice, a common language, and that’s very powerful. It didn’t start with politicians and their speeches. It began on the streets, on social media, in kitchens and pubs. In an independent Scotland we can, and will, stand alongside friends and colleagues seeking change but we cannot, and indeed should not, do this for you. People in England, and Wales and Northern Ireland have to take note of what has been achieved here already and fight their own battles. There is no good reason to stay in the union. Scotland can not only survive, but can thrive, as an independent small nation. A thought for those thinking of voting no. Suppose for one moment that Westminster is being entirely truthful in their threats about an independent Scotland. That they wouldn’t sanction currency union and wouldn’t help to fast-track EU membership. That they wouldn’t support the democratic will of 5.5 million people. Is this a system that you want to be part of? A system where what you think and how you vote has no impact upon the Westminster politicians and ruling elite? If we vote No on the 18th September we can never again blame Westminster for our plight. We are no longer ignorant of the way they are prepared to behave in regard to Scotland. A no vote will cement a new dependency. What will you tell your children? How will you tell them you voted? I can think of nothing worse than telling our children that this was the best they could hope for and that fear caused us to fail to seize this opportunity to let them make their own decisions for their own country. This is an election where our vote, every single one, will count. We can vote yes. We can make a difference. We can do this and for the sake of our children and generations to come, we really must.